According to a report on Sunday, Apple recently applied for the Japanese trademark rights to the "iWatch" moniker, rekindling rumors that the company is actively pursuing the launch of a wearable computing device. As reported by Bloomberg, Apple's "iWatch" filing with the Japan Patent Office dates back to June 3, but was made public just last week. The category to which the company assigned the naming rights covers handheld computing devices and watch-like devices. Apple's Japan application is dated two days prior to an identical filing with the Russian Federal Service for Intellectual Property, also known as Rospatent. The associated report regarding the Russian document noted the first registered "iWatch" trademark application was made in Jamaica in December of 2012. While not definitive evidence that Apple will indeed release a wristwatch-like device, the recent trademark filings are in line with the industry practice of protecting a possible product name before it is released. The Cupertino company has done the same for past products, such as its discreet filings for the iPad in 2006. Although no hard evidence has "leaked" pertaining to the supposed device, some reports claim Apple has dedicated a team of about 100 employees actively working on the project. Competing companies have already announced they will be fielding entries in the wearable computing market later this year, mostly of the devices being wrist-worn "smart watches." Apple rival Samsung said in March that it plans to release a watch-like computing device by the end of this year, its third attempt at such a product. 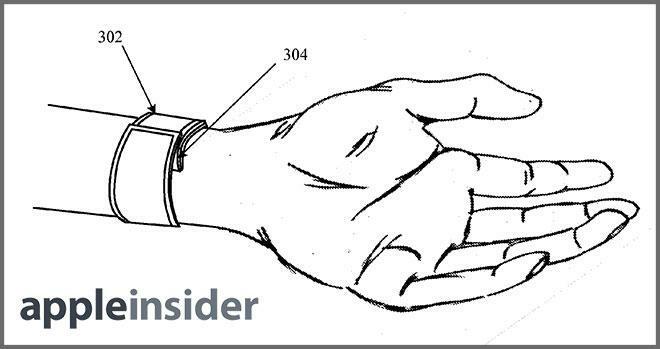 In February, AppleInsider was first to discover an Apple patent filing for a device fitting the description of the so-called "iWatch," which boasted a touchscreen, flexible display fitted into a bracelet-type design.